Foxdenton Estate was acquired through marriage in 1367. In the early years the family continued with its tradition of serving the King in the French Wars and the grandson of the first owner was Knighted at the Battle of Agincourt in 1415. Throughout the fourteen hundreds the estate was as often run by wives as by husbands given their absence in the wars. Sir John Radclyffe and his son Richard were both killed at the Battle of Paris in 1431 leaving widows in charge. In the 1500s there were disputes over ownership between brothers due to one of them leading “an ungodly life”. Sir Richard in this portrait took over the estate in 1579 and was a soldier as well fighting at the Siege of Leith and against the Northern Rebellion of 1569. In the 1600s the family was involved with founding the Oldham Grammar School in 1611 and was swept up in the Civil War. 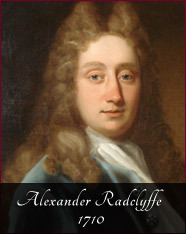 William Radclyffe and his oldest son Robert fought and died at the Battle of Edgehill in 1642. It fell to his third son William, seen here in armour, to continue the estate. He too fought for the King in the Civil War and was knighted on the field at the Battle of Lostwithiel in 1644 and became a Colonel under Lord Hopton. The family was nearly ruined by the fines on the estate once the Parliamentarians won the civil war. The start of the 1700s saw the Estate pass to Alexander Radclyffe who pulled down the old manor house and built the Classical building in brick that stands to this day. He was aware of the troubled times as his father had been shot dead in a duel over politics and it is his choice to back the new Hanoverian King that lead to his survival whilst others in the family went to the scaffold for backing the Stuarts. The rest of the century saw the estate expanded through marriage whilst the area around Oldham saw the start of the Industrial Revolution. During the 1800s the family acquired new estates in Dorset and for most of the time lived there. The estate itself continued to provide the income for the family. We see here Charles James Radclyffe who owned Foxdenton from 1854 to 1882 and is seen here in the uniform of the 5th Dragoon Guards with whom he served. It was one of his distant uncles Colonel Charles Radclyffe who maintained the family tradition of fighting the French when he took part in the Charge of the Union Brigade at the Battle of Waterloo. In the 1900s the family expanded the commercial side of the estate and my Grandfather, seen here in the Uniform of the 1st Life Guards, was the man who incorporated the estate as a company in 1935. It was his vision that helped it survive the disasters of the late 20th century. He and his three brothers all fought in the World War I and in due course members of the family also fought in World War II. In 1923 the grounds of the House were opened to the public and leased to the Chadderton Town Council. Finally the House itself was sold to the council in 1960. 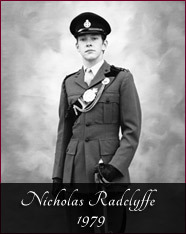 The estate company passed to me in 2001 on the death of my father Alexander Radclyffe. Since then we have tried to develop the company in ways that coincide with our history. The family has been associated with hunting and shooting since the early 1800s and we have been making fruit liqueurs at home like nearly everyone else who is keen on field sports. We have decided to take the old recipes and concentrate on making what we know and love and I am proud to say that we only make what we enjoy drinking ourselves. We hope that this helps us keep Foxdenton Estate alive for another few hundred years.